Just wanted to put these two letters in one place for the TDI club community to reference if needed. I also want to explain the distinction between acceptable and recommends. 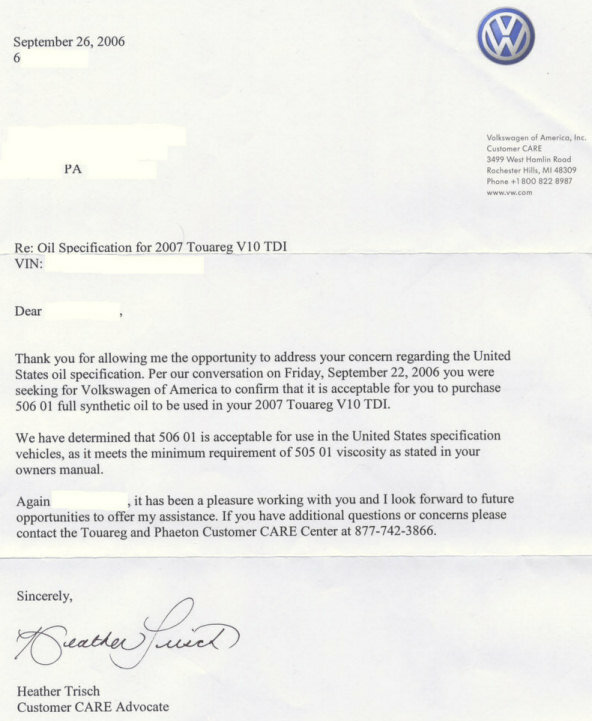 By using the term acceptable VWoA is stating that if you have access to 506.01 or 507.00 oils you may use them in your vehicle that specifies 505.01 - provided you adhere to the maintenance intervals described in your owners manual. VWoA is not using the term recommends because if VWoA recommends a product then US consumers expect the product to be available through VWoA dealerships. 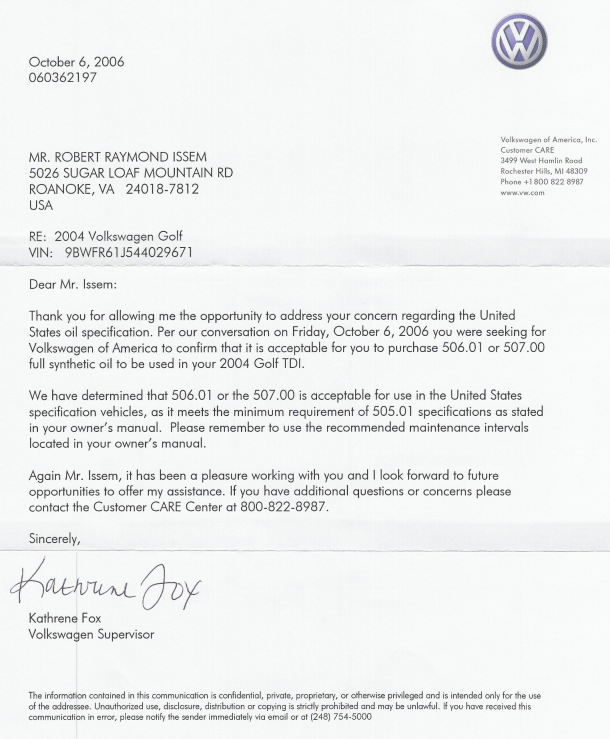 At this time, 506.01 and 507.00 are not available through VWoA dealerships and US consumers should not expect them to be. 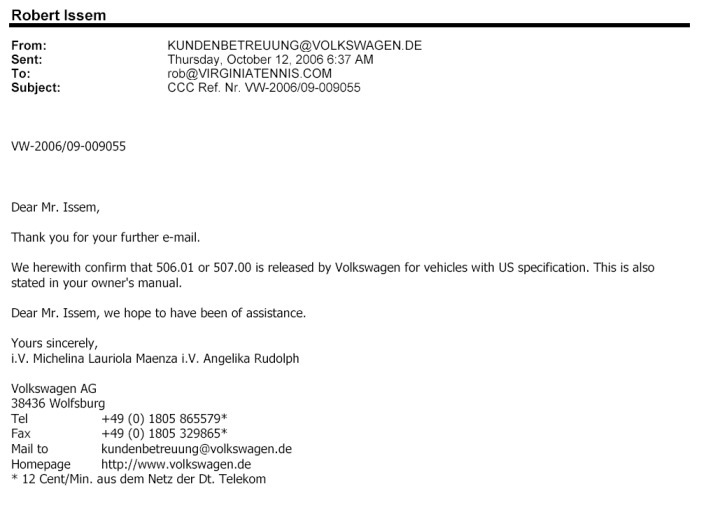 The owner’s manuals in VW Pump Duse TDIs in the US indicate that oils meeting the VW505.01 oil spec should be used. We are fortunate to also have access to oils approved by VW to the later VW pump duse / diesel specifications VW506.01 and VW507.00. VW enthusiasts in the US understand that VW506.01 and VW507.00 are LongLife specifications and are using these oils because they want full-synthetic formulations and increased fuel economy. Can you please confirm that using oils approved by VW to the standards VW506.01 and VW507.00 are acceptable for use in VW Pump Duse TDIs where VW505.01 is specified? Last edited by SUNRG; January 5th, 2007 at 07:16.